Welcome to Apologies for Another Diamond Kings Week: Let us start by saying we're sorry. We know we've nearly drowned our nine readers with Diamond Kings over the years, yet we're bringing you more, just in time for the holidays. So, following in the cleat marks and paint splotches of Atrocious Diamond Kings Week, God-Awful Diamond Kings Week, Dreadful Diamond Kings Week, Ho-Ho-Horrendous Diamond Kings Week and Disturbing Diamond Kings Week, we offer you, with our heads hung low, Apologies for Another Diamond Kings Week. 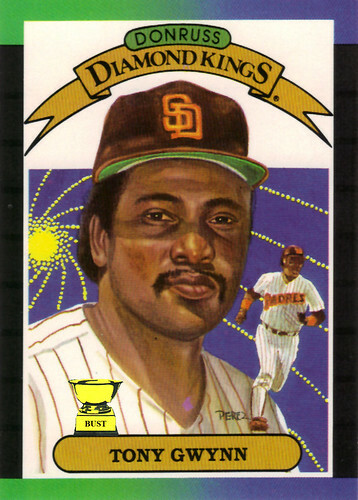 Not quite induction worthy: Tony Gwynn was a Hall of Famer. This card was not. While the Hall stands for all that is right with the game, this card stands for all that's wrong with sports card illustrations. From Gwynn's crooked hat to Gwynn's crooked mustache to Gwynn's crooked neck to Gwynn's crooked eyes — well, we're sensing a trend here. But we understand, when there's an exploding star right behind you, things can get a bit out of whack.